Well, we finally got there! 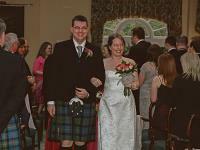 Ruth and I were married on 1st May 2005 at Balbirnie House Hotel in Fife! Thank you SO much to everyone who came to our wedding - we had a wonderful day and it was great to have all our friends and family around us. Here are some of out photos to remind you of the day. Thanks also to Leslie Black, the photographer, who did such a splendid job of capturing out big day. If you would like prints of any of these photos then please get in touch with us (use the contact button on the left) and we'll make the appropriate arrangements. The boys getting their button-holes in place. My brother Neil and I shelter from the torrential rain in a corner. The Piper is lurking under the porch to keep dry too! 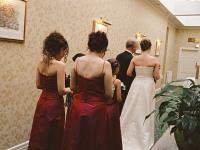 ...before walking at the photographer intimidatingly. Actually, I love this one! Doug demonstrating that he can hold two wedding rings even if later events suggest otherwise. The Stevenson men; my father, my brother and I.
Alex, who very kindly provided some song during our ceremony. Thanks Alex - you were fab! The Orangery where the wedding took place. ...along with the shoes and pearl necklace. The brides bouquet - really it was stunning. Ruth and Liam, appearing from the rooms where the bridal party prepared. Ruth and I, we're just so happy as we make our vows. ...and then stopping to pose properly! Still grinning! This is one of Ruth's favourite photos - the moment we walked down the aisle as man and wife. This is one of my favourite - I'm turning to Ruth as we leave saying excitedly "We're married!!!!!!" Everyone - everyone who came along and celebrated with us and helped to make the day so special. The obligatory Teviot photo. I couldn't have stopped smiling if my life depended on it right then! The family and family friends - a more sedate bunch for now, but only just. This time just us with our parents and Neil and Keith. I love this one - don't the bridal party all look fantastic? Emily and Annabel looking fabulous. Helen, Ruth and Giz looking lovely. It all looks a bit spring-like now the rain has gone away. Animated discussion about - erm - I don't remember. Ian Holohan with the Stevensons. OK, so I'm still a Stevenson in name but the Holohans have made me feel like part of the family! The ballroom all set up for dinner. The cake - we were just thrilled with the cake, thank you so much for making it Doreen! Name cards - novel new name for Ruth. Folks mixing at the reception. Not many hats but quality made up for quantity! Gina and Doug having a wee chat. Vicki from Ruth's old office in London with her husband Adam. Keith just can't resist doing his cheshire cat impersonation for the camera. Liam says a few words to entertain us all. Laugh? We nearly died!!! Neil tries desperately to steal the show in his role as Master of Ceremonies. ...and Neil and Keith are definitely amused. The question is "at" or "with"?!?!? I get peckish during Ruth's speech and try to eat some flowers. Doug doing his turn. Once again, quality made up for quantity on the hat front - nice one Kirsty! One lesson, zero confidence and four left feet. Surely we were doomed? I don't know how but we even managed to have some fun with it. My nifty footwork required close attention from Ruth to avoid me standing on her. Once we make room, Ruth's parents show how it should be done! While my aunt Gill competes for attention. ...and need little encouragement to get the party started. ...for something a little more conservative. Josh and Helen, slick as some Brylcreem in a puddle! Kirsty and Ray tripping the light fantastic. The Audience Business try to capture audience share. I have never seen someone letting their hair down this much with their hair still up before. Sandy and Sarah. Sarah - we're soooo sorry we spelt your name wrong but it was lovely to meet you! Aww - sickening again. Sorry.